Product Information - You can give your pet a luxurious little home by investing in the SAVIC Martha Triple Hamster and Guinea Pigs Cage. 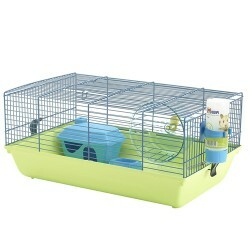 This neatly designed item comes with an elegant white-colored cage and has dimensions of 7 x 3.5 inches. Whats more, the small house as well the slide and pool make sure your pet feels absolutely comfortable and cozy in this cage. A one stop shop for home d?cor and furniture, Pepperfry sells a home product every 30 seconds.